Fedorovych (Fedorov), Ivan [Федорович (Федоров) Іван; Fedorovyč], b ca 1525, d 16 December 1583 in Lviv. Fedorovych (also known as Khvedorovych or Khodorovych) was the founder of book printing and book publishing in Russia and Ukraine. He was deacon of Saint Nicholas Gostunsky Church in Moscow, where, from 1553, he oversaw the construction of a printing house commissioned by Tsar Ivan IV. 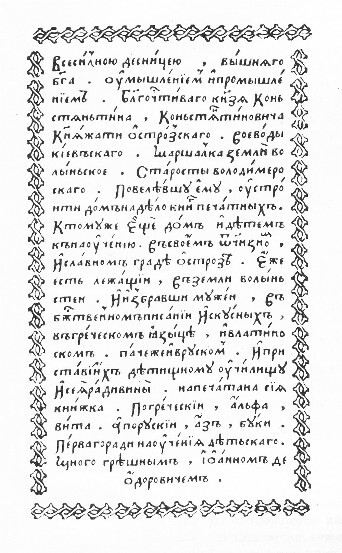 In 1564–5 Fedorovych and the Belarusian P. Mstsislavets published in Moscow several liturgical works in Church Slavonic. 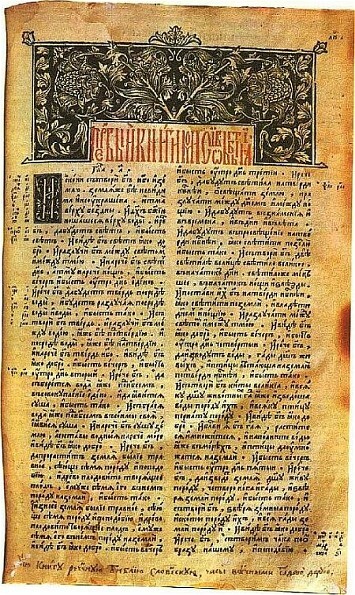 This technical innovation created competition for the Muscovite scribes, who persecuted Fedorovych and Mstsislavets and finally caused them to flee to the Grand Duchy of Lithuania. 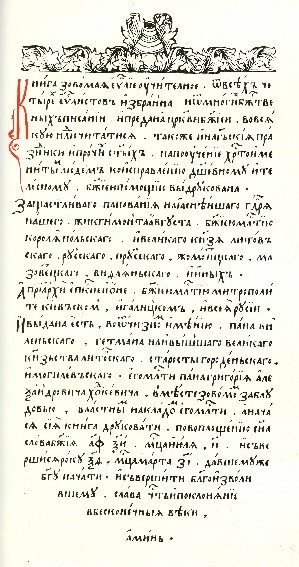 There they were received by the Lithuanian great hetman H. Khodkevych at his estate in Zabłudów (Zabludiv) (northern Podlachia, on the Ukrainian-Belarusian border), where they published Ievanheliie uchytel’noie (Didactic Gospel, 1569) (see Zabłudów Gospel) and Psaltyr’ (Psalter, 1570). In Zabłudów, Fedorovych changed his surname from Fedorov to Fedorovych. He moved to Lviv in 1572 and resumed his work as a printer the following year at the Saint Onuphrius's Monastery. (Fedorovych's tombstone in Lviv is inscribed ‘drukovanie zanedbanoe vobnov[yl]’ [renewed neglected printing].) 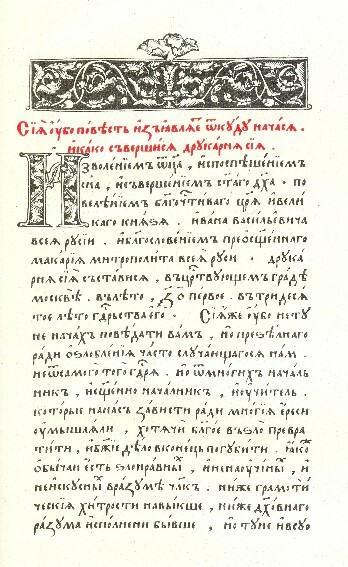 In 1574 Fedorovych, with the help of his son and Hryn Ivanovych of Zabłudów published the second edition of the Apostolos (originally published in Moscow), with an autobiographical epilogue, and Azbuka (Primer). 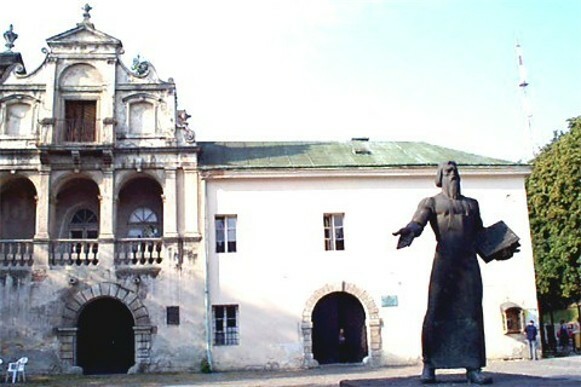 Fedorovych was known as the ‘Muscovite printer’ or Iwan Moschus (Ivan the Muscovite) in Lviv, a name used more to identify his place of origin than his nationality. 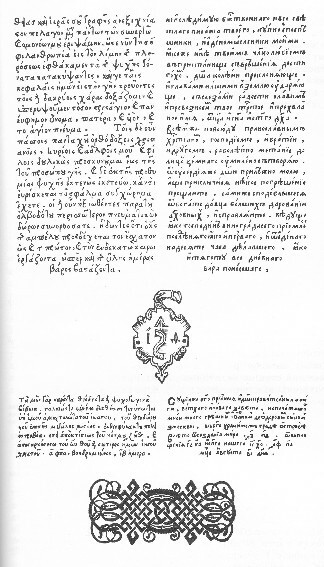 In 1575 Fedorovych, in the service of Prince Kostiantyn Vasyl Ostrozky, was placed in charge of the Derman Monastery; in 1577–9 he established the Ostrih Press, where, in 1581, he published the Ostrih Bible and a number of other books. Fedorovych returned to Lviv after a quarrel with Prince Ostrozky, but his attempt to reopen his printing shop was unsuccessful. His printery became the property of the Lviv Dormition Brotherhood (later the Stauropegion Institute). The brotherhood used Fedorovych's original designs until the early 19th century.